Posted on February 17, 2010, 11:45 pm, by E gan F, under Art. Just to update the re-roof watchers: I’m back in the studio and painting again. You’re looking at 2 walls of paintings in progress. There are more not in view. The latest plan is for some of these to be posted in an online sale over the next couple of weeks, and others to appear in a show. The building itself is still a construction site covered in scaffolding, with heavy renovations ongoing right outside my door, but I should be able to accept visitors again very shortly. In the meantime you can always have a look at the photos of how the studio and yard looked before the renovations began. It actually looks cosy now compared to before. Deceptively so. It’s really not. With the exposed loading doorway to the world it’s still the same temperature inside as out. But an actual door is going in - waiting for glass for it at the moment - and then I can look at blocking the gaps at the windows. Put that with the space beside me being renovated (to possibly include insulation) and I think come next winter we can start talking, well not cosy, but just not as freezing. Yep, alas the insulation - if any - isn’t for me but for next door. Still though a space next door with any warmth can only be good. In my own space what you can see now is the standard felt under the slates - where there used to be crumbling plaster. There’s a spiral staircase going up outside - when all the changes are done I’ll post some new photos. 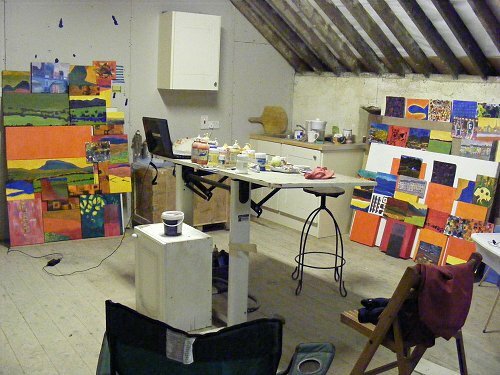 Nice set-up, except for the temperature .. does the cold temperature affect how you paint on the canvas etc. ? It does Séamus. I use acrylics which struggle to dry below 40F. And because it’s exposed to the outdoors it’s often quite damp in there - especially with the proximity to the river (the Liffey being at the bottom of the hill) - and that also slows the drying process. So paint that in a normal house would take minutes to dry, on canvas or on the palette, takes several days to dry in the studio. To that end, where it doesn’t matter I paint thinner to speed drying, and I just have to wait a lot - which is why I have somewhere between 70 and 100 paintings on the go. It changes things basically. Arresting drying is sometimes a good thing so I also try and avail of the opportunities that presents - all a bit odd for me though after spending years getting very comfortable with the almost instant drying that comes with acrylics.